I learned of the death of Yumi Ito, the last remaining member of 1960s pop duo The Peanuts, while battling a giant moth that had found its way into my apartment. This interval of lepidopteran agitation was strangely apt, however, since Yumi and her identical twin sister/bandmate Emi Ito were perhaps most famous as the diminutive pixie ambassadors for Toho film studios’ god-beast Mothra. Beginning in the monster’s eponymous 1961 film, the duo’s high-pitched harmonies formed the eerie mantra that summoned forth the moth-like protector of Earth. The harmonies that made The Peanuts’ music so irresistible to giant moths were key to their success with mere humans, too. In recent years, the anachronistic way Japan has regulated dancing under the same set of laws that govern prostitution has provoked ridicule, but in the 1950s and ’60s the jazz clubs that incubated the live scene weren’t always the most salubrious places. Usually run by the yakuza, and often with the U.S. military as a key supplier of both audience, and new music and styles, the environment was a far cry from the showbiz bubble that surrounds today’s J-pop stars. To make an impact in this environment, you had to be able to sing. 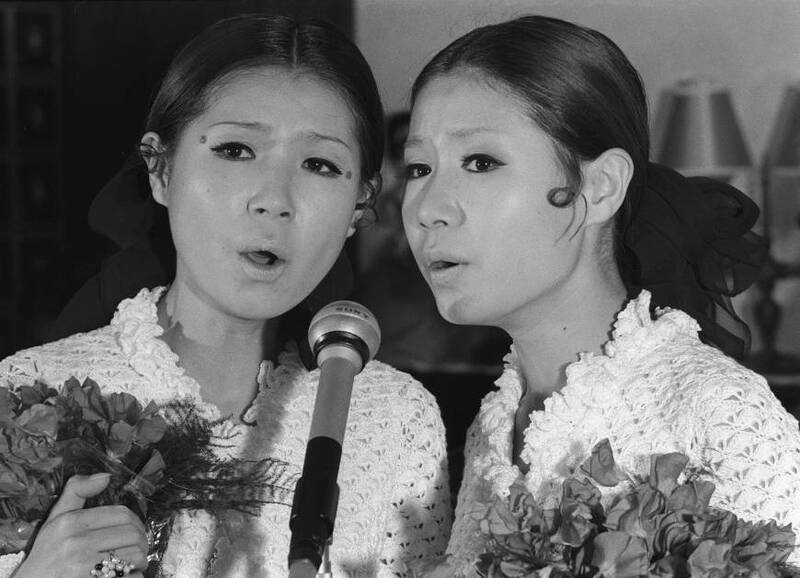 It was while performing at a club in their hometown of Nagoya in 1958 that the Ito twins were discovered by pop impresario Sho Watanabe of the talent agency Watanabe Productions. He brought them to Tokyo and gave them the name The Peanuts. The following year they made their recording debut with the song “Kawaii Hana” (“Cute Flower”). In the 1960s, Watanabe Productions (known colloquially as “Nabepro”) was the agency you needed to be with. They had monopolistic dominance of the live circuit, access to the film industry and connections to the fledgling medium of TV. If you crossed them, you would disappear without a trace. “If you’re not Nabepro, you’re not human,” went the saying at the time, but if you were in the family, treasures awaited. As one of Nabepro’s so-called Three Great Talents (alongside The Drifters and Hajime Hana & The Crazy Cats), The Peanuts bestrode the Japanese music scene like diminutive twin colossi. They were among the first wave of Japanese pop acts to gain attention in the United States, appearing on the Ed Sullivan and Danny Kaye shows. 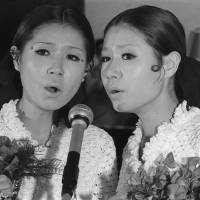 The U.S. wasn’t the only connection Japanese pop had to the West in the ’60s, though. It was an era when European music had an influence on Japanese pop scene that wouldn’t be replicated until the Eurobeat explosion of the early ’90s. Japanese versions of French and Italian songs in particular were common features of the charts, with the syllable-timed vocal rhythms of French and Italian language perhaps making for an easier transition into Japanese than the more fluid, stress-timed vocals of English language pop. The Peanuts’ release roster was peppered with Japanese versions of contemporary European songs like Italian singer Mina’s hit “Tinterella di Luna” (released under the Japanese title “Getsuei no Napoli”). The twins also struck up a friendship with German-Italian singer Caterina Valente, with whom they traded cover versions, and this connection helped gain them attention in the West German entertainment world. Women in the entertainment business were still expected to uphold certain social norms, however, and the pursuit of a career after marriage was a strict no-go until being challenged by singers like Seiko Matsuda in the ’80s. The Peanuts retired from the entertainment world in 1975, when Emi married fellow Nabepro star Kenji Sawada (they divorced in 1987), but the world they had come to represent in the ’60s was already on the way out. Watanabe Productions’ stranglehold on the industry had been decisively broken by the rise of TV as a medium for developing talent, with the show “Star Tanjou!” (“A Star is Born!”) catapulting rival agencies such as Hori Production onto an equal footing. Meanwhile, the seedy glamour of the club scene was fading into the past with the departure of the American occupiers from most of Japan. At the same time, Japanese pop had begun to develop its own musical style, breaking free of its European and American influences. With Emi passing away in 2012, Yumi was the last remaining Peanuts sister. With the news that she passed away in May, another small part of Japanese pop’s fascinating formative years has also passed from our world into memory.